Good Monday everyone I hope you all had a great weekend. 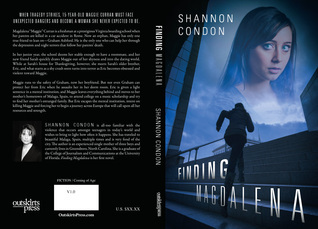 Today we are going to review SAVING MAGDALENA by Shannon Condon. Magdalena “Maggie” Curran is a freshman at a prestigious Virginia boarding school when her parents are killed in a car accident in Rome. Now an orphan, Maggie has only one true friend to lean on—Graham Ashford. He is the only one who can help her through the depression and night terrors that follow her parents’ death. In her junior year, the school deems her stable enough to have a roommate, and her new friend Sarah quickly draws Maggie out of her shyness and into the dating world. While at Sarah’s house for Thanksgiving, however, she meets Sarah’s older brother, Eric, and what starts as a shy crush soon turns into terror as Eric becomes obsessed and violent toward Maggie. Maggie runs to the safety of Graham, now her boyfriend. But not even Graham can protect her from Eric when he assaults her in her dorm room. Eric is given a light sentence in a mental institution, and Maggie leaves everything behind and moves to her mother’s hometown of Malaga, Spain, to attend college on a music scholarship and try to find her mother’s estranged family. Then Maggie gets a roommate and Sarah opens her up to so many new things like dating and having fun. Then one Thanksgiving Maggie's life alters and she becomes the deer in the headlights of Sarah's brother . A crush soon turns into terror for Maggie a terror that Graham can't even save her from. Even traveling to Spain doesn't give enough distance between Maggie and her stalker . As she makes a life there she reconnects with her mother's family and finds true love . But will that be enough to keep her safe and alive. The author takes us on an adventure with Maggie , from all over Europe to Virginia back to Spain. The characters were well written and you got to watch them grow as you read . At the beginning you see Maggie as naïve young woman , who even though travelled all over Europe was still kind of naïve about things. She had to grow up fast and you start to see that as she and Sarah start hanging out. You really see her start to mature as she goes through all the hell that she went through. You see come out the other side a very strong woman, knowing what and who she is . I truly liked her and wanted to see her come out the other side stronger and wiser. The character of Graham is a likable guy who loves her as a best friend an first love. They are so sweet together and who never forgets their first love . He would do anything for Maggie and does. He protects her and listens to her . he is just a sweet all around guy. The rest of the cast of characters are so diverse and are there to help Maggie when she needs it . She can count on them to help her out when she needs it. Over all I really liked this book. The characters were brilliant and the story line flowed well . But a times I felt a little disconnected with Maggie, like how she started the book with Maggie being 15 at the start and be in her twenties when she is in Spain. I just felt like wow what a jump. The author has us on the edge of our seats as we read, from her student years to Spain and Maggie as a spy. I want to hopefully read more about Maggie as a spy, she would be so good at it , I think.